“Pension freedom” from 6th April means that millions of people over 55 can withdraw all their pension savings. However this potential avalanche of cash will undoubtedly attract many crooks, scams and unwise investments. You may be unhappy with the returns your pension has achieved or be disappointed about the annuities available, but a lifetime’s savings can be lost in a moment. “Early pension release” schemes which encourage people to withdraw their pensions before the age of 55 – as well as losing all your money you may also find HMRC makes an unauthorised payment tax charge of 50% of the value. 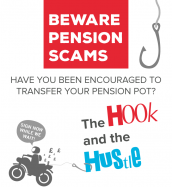 You can decide how to take the money from your pension pot when you retire. It doesn’t matter if your pot comes from a private pension you set up yourself, a workplace pension you paid into, or both. But in each case the money you receive will be taxed as income, possibly at up to 40% if your total income in one year goes much over £40,000. Not all pension schemes offer all options. You don’t have to stay with the scheme you paid into. You can shop around to find the offer that best suits you. If you are in a company defined benefit scheme, also known as a final salary pension, this freedom does not apply. You could transfer your pension pot into a personal pension (after consultation with an independent financial adviser) but this would not normally be a wise decision as final salary pensions usually offer much better returns. The Government has promised free guidance for anyone who wants it. A good starting point is the Government’s Pensionwise website www.pensionwise.gov.uk. You can also phone the Pensions Advisory Service on 0300 123 1047 or call into your local CAB, where you will undergo an initial check to determine whether the Pensionwise service is suitable for you. If it is you will be informed how you may best get guidance: on-line, by telephone or via a face to face appointment. The CAB can either arrange your face-to-face appointment or refer you to a convenient Pensionwise delivery centre. If you have more general questions about your circumstances in retirement, eg, whether you might be entitled to benefits such as Pension Credit, Carer’s Allowance, Housing Benefit or Council Tax Reduction, visit our website to find out where you can get face-to-face advice.